Cape to Cape drive is one of our favorite road trip in South Africa; beautiful, many things to do on the way and it’s a relatively short drive, about 400km. There is some confusion with two points Cape Of Good Hope, Cape Point and Cape Agulhas. To clarify Cape Agulhas in Struisbaai is the Southernmost Tip of African continent, Cape of Good Hope and Cape Point are two scenic capes close to Cape Town, scenery wise they are more impressive than Cape Agulhas; dramatic cliffs, white-sand beaches, breath-taking look outs and ice-cold blue waters of the Atlantic Ocean. Cape of Good Hope to Cape Agulhas drive can be done as a separate trip from Cape Town and back or you can combine it with the Garden Route trip and continue driving along the coast after visiting the Southernmost Tip of Africa. Cape Town – Camps Bay – Hout Bay – Chapman’s Peak Drive – Noordhoek – Kommetjie – Misty Cliffs – Cape Point National park (Cape of Good Hope) – Boulders Beach (Simon’s Town) – Muizenberg – Strand – Gordon’s Bay – Rooi-Els – Betty’s Bay – Harold Porter Botanical Garden – Kleinmond – Hermanus – (Gansbaai – Elim) – Napier – Bredasdorp – Arniston – Struisbaai – Cape Agulhas. Stunning scenery; sandy beaches, coast line, cliffs, mountains, view points. Short distances between places of interest, no sitting in the car for hours. Many activities to do; diving, snorkeling, hiking, swimming, surfing, going out on a boat etc. Different accommodation and food options for any budget. Some great wine estates on the way. Good chances to see animals; seals, dolphins, whales, sharks, penguins, sea birds, ostriches, dassie, deer. It’s suitable for any kind of travels be it adventure seekers or comfort lovers. All the route is on a tarred road you can drive with any car, it can be a nice trip on a motorbike if you’re a confident driver. It’s not a camping trip there are a couple of caravan parks in Struisbaai and Cape Agulhas but they’re quite empty most of the time except Christmas and Easter holiday. Backpacker hostels can be found in Muizenberg, Betty’s Bay, Hermanus and Struisbaai. Every town has at least a small shop but if you need a proper supermarket you can find them in Muizenberg, Strand, Hermanus, Napier, Bredasdorp. Water temperature. Around Cape Town on the Atlantic side it’s freezing all year around, between 9-14C, for any water activities you need a wet suit. It gets warmer inside False Bay (Strand, Gordon’s Bay) and further along the coast, in summer up to 20C. Sunday is not the best day to be in a small town most of the restaurants, wine farms and even shops are closed. On Saturdays most wine farms are opened only half day usually between 10am and 1pm. There are many wine farms in and around Hermanus that offer tasting and have restaurants you can basically spend the whole day enjoying exquisite red and white wines and delicious food. You can follow the official wine route and go to all 13 wineries or visit some of them. Bouchard Finlayson Winery (Hermanus), probably one of the finest wine estate in the area. Tasting 3 wines – ZAR20, 6 wines – ZAR40. Birkenhead Brewery & Winery (Stanford). Except for wine and beer they have different flavored ciders. Black Oystercatcher wines (Elim), tasting ZAR70 per person, they make own beers some of them have quite a unique taste e.g. coffee with condensed milk. Ciders, Birkenhead Brewery, Stanford. On the way from Hermanus to Arniston. Jakes on the Common (Noordhoek), cool design, great staff, good food. Good place to stop for a drink, a cup of coffee with dessert (they have great ones) or lunch. We loved their Tasting Platter for Two, it was too early for lunch. The Foodbarn (Noordhoek), a great variety of food; breakfast, deli, tapas, a la Carte menu, tasting menu (min. 5 people) and good wines. The place is quite expensive but you can spoil you a bit and enjoy a tasty meal. The Brass Bell restaurant and pub (Kalk Bay) this place is popular with locals; fresh sea food and fish, steaks and pizzas plus great variety of wines (red and white). The restaurant sits on the rocks right at the sea great view and fresh air are guaranteed. Cape to Cuba restaurant (Kalk Bay) has a unique design, it’s worth to stop here just for a cup of coffee or a cocktail, a little Cuba on South African soil. Tapas menu, meat, fish, burgers, desserts and of course cocktails. Colorful and vivid place good for meeting up with friends or small romantic dinner. Tiger’s Milk Kitchen Bar (Muizenberg), a place to go for a party dinner, a big open plan restaurant, with cool vibe, pizzas, steaks, tacos, burgers and big bar menu. Great place to eat with friends, not for a romantic dinner. Bientang’s Cave (Hermanus) located all the way down to the sea, salt water splashes refresh you in a hot summer day. Don’t be surprised if while eating you see a whale or a dolphin in the sea not far away. It’s the place to be if you’re a sea food lover, fresh oysters, calamari, cray fish, mussels and fish perfectly fried or grilled with cold white wine, lunch or dinner in this amazing spot is something special. 55 Knots (Struisbaai), great view from the terrace, breakfast menu, quite good pizzas, sea food, fish and meat dishes. Probably the best coffee in Struisbaai/Cape Agulhas. Gets quite busy in December, January and sometimes over the weekends. Accommodation – a dorm bed between ZAR160 – 190; a double room from ZAR500. Petrol – the drive is only km, you’ll spend on petrol between depending of a vehicle. 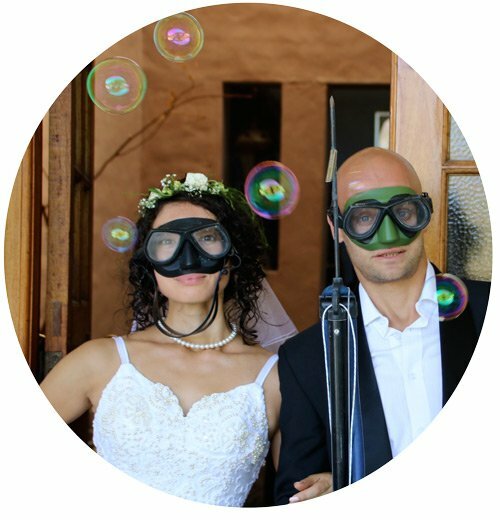 Entrance fees – Chapman’s Peak toll road – ZAR45; Cape Point National Park – ZAR145 adults, ZAR75 children; Boulders Beach – ZAR75 adults, ZAR40 children; Harold Porter Botanical Garden – ZAR25 adults, ZAR10 children; Penguin Sanctuary, Betty’s Bay – ZAR20 adults, ZAR10 children. Food – cooking your own meal is always the cheapest option, this way you can get away with ZAR150-200 per day. Eating out from ZAR150 pp per meal. Activities – these always add quite a bit to a budget but usually make a trip more exciting; seal and Cow shark dive in Simon’t Town – ZAR1950 pp; surfing lesson in Muizenberg – ZAR400 pp (individual lesson) including gear; surf board rental – ZAR70 per hour; Whale watching boat tour in Hermanus – ZAR1200 pp; shark cage diving in Gansbaai – ZAR2100 pp. November to March – long hot sunny days, no rain, though December and beginning of January are usually quite windy. April and May – still good weather, days are shorter, nice and warm, more chances for rain. June to August – days are cool and short, many parks close earlier, a lot of rain but you can be lucky and get a couple of nice days. September and October – beginning of spring, warmish days, everything is green after winter rains, flowers and fruit trees in blossom. Driving past wheat fields on the way to Struisbaai. The suggested itinerary is for 3 days but you can adjust it to your needs and time, we’d say it’s possible to do the drive in two days but you won’t have time to do any activities only sightseeing. If you have more time you can easily spend 4-5 days or even more if you want to chill in a nice and quite place somewhere on the sea. Cape Town – Camps Bay – Hout Bay – Chapman’s Peak Drive – Noordhoek – Kommetjie – Misty Cliffs – Cape Point National park (Cape of Good Hope) – Boulders Beach (Simon’s Town) – Muizenberg. It can take anything between 7 and 10 hours, depending how much you stop on the way. Camps Bay – beautiful beaches, ice-cold water. Chapman’s Peak drive – one of the most scenic drives in South Africa; along the coast with many look outs. Cape Point National park – here you can spend all day, there are many driving and walking routes, some beautiful beaches though water there is freezing cold. Boulder’s Beach, Simon’s Town – a small hidden white-sand beach surrounded by huge boulders with quite a few penguins swimming around. Surfing in Kommetjie, nice waves for all levels, there is a board rental place near the beach. Go out with a boat in Hout Bay to spot some dolphins and seals. Hiking in Cape Point National park, there are several short hikes as well as a 2-day hike with an overnight hut. Swimming, relaxing and watching penguins at Boulder’s Beach. Diving or snorkeling with seals and cow sharks at Simon’s Town with Pisces Divers. Surfing or SUPing in Muizenberg, you can get a surfing lesson or rent a board from one of the surf shops here. Check swell and wind. If it’s weekend or public holiday be ready to spend some time queuing to enter Cape Point National park luckily the queue moves quite fast. Don’t walk after dark on the beaches around Cape Town unless there many people and rather skip Noordhoek beach there were several cases of mugging and hijacking there recently. If you want to do a hike we’d recommend to do it inside Cape Point National park there are quite a few walks around. Don’t hike in the mountains around Simon’s Town or Muizenberg, even if you’re more than two people there were some mugging and robbing incidents recently. Most of the time the route goes along the coast with many stunning look outs and endless white-sand beaches. The distance is only km but there is so much to see here that it’ll take you the entire day, the earlier you start the better. The first stop is Camps Bay the fanciest neighborhood of Cape Town and the place with the most expensive property in the country. After you drive over the pass to Hout Bay where you can see seals in the harbor, for tips locals will show you how they feed seals. Finally you’re getting to Chapman’s Peak Drive. It’s on a toll road you pay ZAR45 for a car to drive through but it’s one of the most beautiful drives in the country and absolutely worth it! Chapman’s Peak Drive, the road meandering along the coast. Take you time in Cape Point National park there is a lot to see here, you can actually spend the whole day just driving and walking around, it’s an incredible beautiful place. The highlights of the park; Cape Point, Cape of Good hope, the lighthouse, Diaz Beach, Kleine Bucht, Vasco Da Gama Cross, Bordjiesrif Tidal Pool. There are a couple of day trails; Ship Wreck trail (3-5km), Phyllisia Circuit (7km), Kanonkop (5km), Cape of Good Hope Trail (3,5km), Lighthouse Keeper’s Trail (2km). Ask for a map at the entrance, all the trail are marked and relatively easy. We have done all of them as a part of 2-day Cape of Good Hope hiking trail. Opened October – March 6am – 6pm, April – September 7am – 5pm. Entrance fee ZAR145 adults, ZAR75 children, children under 6 years free. Cape of Good Hope at sunset. A small white-sand beach hidden between huge boulders with calm warmish waters is a part of marine protected area. Exceptional beauty is not the only reason that attracts visitors to this beach every day, cute African penguins are always around; walking, swimming or resting on the rocks. Children love this place! Take your swimming costume and a towel you can spend some time here chilling on the beach and watching penguins. Opened; December – January from 7am to 7.30 pm; February – March from 8am to 6.30 pm; April – September from 8am to 5pm; October – November from 8am to 6.30pm. Entrance fee ZAR75 adults, ZAR40 children. To top up your marine animals experience in Simon’s Town go for a diving or snorkeling trip with Pisces Divers to see seals and Cow sharks (they are not known to attack divers) the dives are relatively easy dives done at about 12m. You need at least an open water qualification to do these dives, snorkeling is also possible. Diving and snorkeling trips are usually in the morning if you stay overnight in Muizenberg it’s a short drive to the dive shop, about 15km. A good place for surfing or learning how to surf, there are a few surf shops on the beach so if you have more time you can stay here for a couple of days. Don’t forget to check out the colorful cabins in Muizenberg, awesome contrast with white sand beach and blue sea. One of the top Instagram places around Cape Town. If you happen to be here on Friday go to Blue Bird Garage and Food market, it’s an indoor market with a huge variety of food, snacks, beer and wine from steaks to vegetarian dishes, from craft beers to exclusive wines. We even found real Argentinian empanadas (pies) that a guy from Buenos Aires makes himself. Nice vibe, music, very chilled and social place great way to spend a Friday night in Muizenberg. Market opened every Friday from 4pm – 10pm. Be aware accommodation in Muizenberg is usually booked long beforehand as there are always many tourists here, especially those near the surf spot. If you’re planning to come here rather book in advance. Budget – African Soul Surfer ZAR190 for a dorm bed. Perfect place for backpackers; chilled staff, nice vibe, very close to the beach. You can rent a board or take a surf lessons here. They have daily yoga classes as well. Great place to meet people, surf or learn to surf and chill in a lounge after a long day in the sea. Middle price – Muizenberg Dunes Apartment complex ZAR850 for an apartment (sleep 4 people). Great value for money especially if you’re more than two people. Good location, 10min. walk to the beach, fully equipped flat with TV, wi-fi, outside pool, private parking. Luxury – Surferscorner Self Catering apartments with sea view ZAR1600 for a double. Perfectly located across the road from the main surfing beach, spacious 1, 2 or 3 bedroom apartments ideal place for a couple or family holiday. Big fully equipped apartments, 120m2, with balconies overlooking the sea, wi-fi, private parking, TV etc. Muizenberg – Strand – Gordon’s Bay – Rooi-Els – Betty’s Bay – Harold Porter Botanical Garden – Kleinmond – Hermanus, can take between 6 and 8 hours with stops for photos, lunch, sightseeing etc. Beautiful drive along the coast from Gordon’s Bay on. Stony Point Nature Reserve, penguins sanctuary in Betty’s Bay. Whales and dolphins in Hermanus. Swimming at Koel Bay one of the beaches on the way from Gordon’s Bay to Rooi-Els. Hiking in Crystal Pools Nature Reserve, there is a nice 2-3 hours return hike to the falls and natural pools, 8km walk. Need to book beforehand. Opened from November to April, sunrise to sunset. Entrance ZAR60 per person. Surfing at Koel Bay beach, bring a surf board with you and watch for sharks. Snorkeling in Rooi Els, you can spot cray fish water is not as cold as in Cape Town but you still need a wet-suite. Hiking in Harold Porter Botanical Garden. Whale watching in Hermanus, season from August to December, the peak season October – November when Southern-right whales are in the area. Outside the season you still can be lucky and spot dolphins, seals, sharks. The first part of the drive from Muizenberg to Gordon’s Bay is not that spectacular though you drive between sand dunes for some time. From Gordon’s Bay on you’re back on the scenic coastal road with many view points and some great and usually empty beaches. When stop at a view point near Gordon’s Bay look out for seals there are usually some in the water close to the shore. Beautiful view on the way from Gordon’s Bay to Rooi-Els. A nice small town of Betty’s Bay with long and usually empty white-sand beaches surrounded by the mountains. The beach is a nice place for a picnic on a not windy day. If after visiting Boulder’s Beach you’re still keen to see more African penguins go to Stony Point Nature Reserve, there are hundreds of penguins there usually chilling on the beach right at the entrance. Opened daily from 8am to 4.30pm. Entrance fee ZAR20 adults, ZAR10 children. A beautiful garden full of lush green vegetation and flowers, a nice place to come for a picnic, to walk around the garden or have a meal at the restaurant. There are several day hiking trails here; the Zigzag, Fynbos and Leopard’s Kloof Trails. To visit Leopard’s Kloof or to do the hike there you have to start before 1pm, inquire at the entrance. Opened Mon – Fri 8am – 4pm, weekends and holidays from 8am – 5pm. Entrance fee ZAR25 – adults, ZAR10 – children. If you’re in the area between August and November we’d recommend to do a whale watching tour, southern right whales are in Hermanus this time of the year and chances to spot them are quite good. If you want more adrenaline activities you can do shark cage diving where you might see a great white shark or at least some bronze whaler sharks. You’ll need the whole morning for any of these activities so it’s better if you stay in Hermanus for an extra night. Whale watching and shark diving tour boats leave from Gaansbaai, 42 km from Hermanus. Every year at the end of September (28th – 30th September in 2018) the Whale Festival takes place in Hermanus; food market, music stands, parade, treasure hunt and more is waiting for you here. During the whale season go to one of the restaurants with the sea view you have a good chance of spotting whales while enjoying your meal. Budget – Hermanus Backpackers ZAR190 for a dorm bed, ZAR500 for a double. Nice chilled place with dormitories and private rooms, two communal kitchens, tour desk, good wi-fi, outside pool, great for single travelers and groups of friends. Middle price – Cloud Nine ZAR700 for double. A lovely guesthouse, situated 5min. walk from the center, with small outside pool, BBQ facilities, fully equipped shared kitchen, lounge area, wi-fi, tours can be booked upon request at the reception. Ideal for couples and families. Luxury – Shore’s Edge Luxury Bed & Breakfast ZAR1600 for a double. Perfectly situated 1min. walk from the beach, at the sea front this is an ideal place for a romantic holiday. Balcony with sea view, modern decor, spacious rooms, wi-fi, continental breakfast, friendly and helpful staff all these will make your stay here unforgettable. Southern right whale tail visible during a dive. Hermanus – (Gansbaai – Elim) – Napier – Bredasdorp – Arniston – Struisbaai – Cape Agulhas, can take between 6 to 8 hours. Elim, a small village with cute little houses lined along the main street. Cozy town of Napier with many cafes, restaurants and souvenir shops on the main street. Shark cage diving in Gansbaai, all year round though inquire before as sometimes orcas are in the area and sharks (Great Whites) disappear. Wine and beer tasting, there are a couple of places around Hermanus and some on the way to Cape Agulhas. Watching sunset on Struisbaai beach. Spotting Parrie, a huge stingray that lives at the harbor of Struisbaai. There are different route options; first is driving from Hermanus through Gansbaai and Elim, skip Napier and keep driving on the gravel road towards Arniston and Struisbaai. This route is longer route, adds about 30km but it’s always more fun to go through the countryside instead of sticking to the main road. 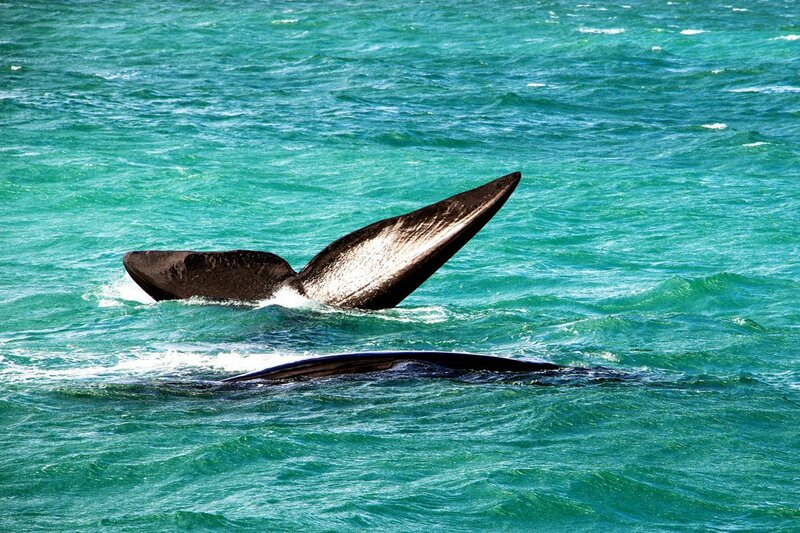 Gansbaai is a small town the main reason tourists come here is whale-watching or shark diving as the tours start here. Except for these there is African Penguin and Sea Bird Sanctuary and Rescue Center here you can see the feeding of penguins every day at 3pm while drinking coffee or eating lunch at the coffee shop. No entrance fee. From Gansbaai drive through Elim on the way to Struisbaai, it’s a small but lovely fisherman town with white cottages lined up along the road. Just outside Elim there is a wine estate/restaurant Black Oystercatcher Wines. You can do wine tasting here, ZAR70/US$ per person, they have only fancy expensive wines. They sell craft local beer and souvenirs as well. Over the weekends and holidays it’s better to book a table beforehand. Second option, driving from Hermanus past Stanford through Napier it’s shorter if you take this route you’ll skip Gansbaai and Elim but you get more wine farms on the way. Napier is a lovely town with beautiful old houses, good restaurants, cozy cafes and souvenir shops. Looks very beautiful in Jacaranda season between October and December. If you’re a sweet tooth don’t forget to stop in Bredasdorp, next town after Napier on the way to Arniston/Stuisbaai. There is a cafe/shop Soetmuisberg on Long Street (the one you drive on from Napier) they sell the best ice-cream ever, for R18 you get a huge sugar cone topped with a tower of two different flavor ice-creams, from blueberry cheesecake to Bar one and chocolate flavors. Arniston is a small fisherman town where many locals go for December holiday, the highlights of the town are white-colored fisherman’s cottages at the harbor and Waenhuiskrans Cave. You can visit the cave only at low tide, check tides here. The only access to the cave except from the sea is through a hole in a cave at high tide it’s under water. The cave is big with a beautiful view over the ocean, it looks like a cave from Pirates of the Caribbean or any other treasure hunting movie. Children will love it! No entrance fee. Struisbaai and Cape Agulhas officially are two small town but in fact one place, it’s a very quiet place out of season, in December-January and Easter many South Africans come here for the holiday. The main thing that attracts tourists here is the Southernmost Point of African continent, the point officially divides two oceans; the Atlantic and the Indian though there is no visible line between them. Though the point is inside Agulhas National park there is no gate or entrance fee. The Southernmost Point got an upgrade recently a big metal map of Africa with the main geographical attractions was installed at the tip. Another though local size attraction is Parrie the Stingray, a big old stingray that has been living in the harbor for many years. Sometimes there are two or three stingrays in the harbor. Struisbaai has a nice long beach for swimming, running and watching sunset or sunrise. The best pizza/sea food restaurant according to locals (we confirm it) is SeaGulls Pub and Grill in Cape Agulhas. They have great wood fired pizza, delicious sea food, all sort of alcoholic and non drinks and coffee. The vibe is really nice and the staff is super friendly and fun. The top floor is more informal pub style place, the bottom floor more opt for a romantic dinner. Budget option – Cape Agulhas Backpackers, ZAR160 for a dorm bed, ZAR420 for a double. We love Struisbaai Backpackers and stay there quite often; cool vibe, nice pool, garden, fair and braai place, bar, good location close to the beach and jetty. They have dorms, private rooms with shared bathroom, in-suite cabins and camping spots. Middle price – Top Deck, ZAR800 for an apartment (two people), located 1min. walk from the beach, close to Cape Agulhas. Fully equipped apartment with balcony, kitchen, TV, washing machine etc. Luxury – Mermaid Guest House, ZAR1200 for a double, continental breakfast included. A beautiful set up with a swimming pool, outside terrace, located close to the beach and restaurants, ideal place for a romantic holiday. Sunset on the beach of Struisbaai. We bought our Couple Wild Card three months ago when we did Kalahari road tip. On this trip we saved ZAR450; Cape Point ZAR300 (ZAR145 x 2) and Boulders Beach (ZAR75 x 2) on entrance fee for both of us, which is a half of what we paid for the card. If you are a frequent visitor to National parks it’s definitely worth to buy a Wild Card. Hello, Heba! Thank you for the comment! We’re glad you found our post helpful!